Mr. Clarrie (Jack) Judd, at the age of 95 years,retraced his experiences in relation to the Stony Point School. 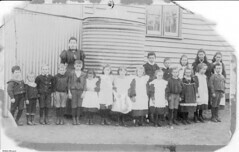 The school building was made of Weatherboard, built off the ground and with a residence attached.Neither of the first two teachers lived in the house, but boarded at nearby farm houses and they rode their bicycles to and from school. The one teacher school catered for children from Grade 1 through to Grade 7, and there were approximately 25 children attending. The school building was not used as a church. The pile of stones remaining on the property were from the tank stand, or rear addition. In the newspaper "The Bunyip" 5th November 1880 an article titled Mallala Oct 27and attributed to( from our own Correpondent ) says this about the Stony Point School.
" 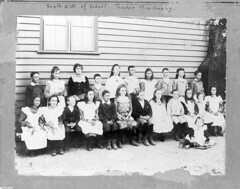 We hear of complaints about the crowded state of the Government school at Stony Point.The building is a wooden one, built for about forty children, and there are about seventy attending. Some have to go in the porch when the others are writing in order to make room." 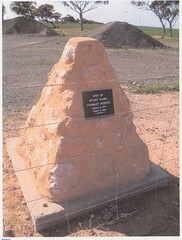 On site is a limestone cairn which was erected as an initiative of the Mallala Museum Committee and assisted by a grant from the District Council of Mallala. 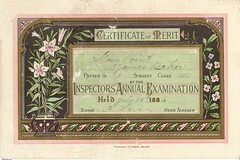 Do you remember Stony Point School ? Then Join up and add your memory here.